Niagara Falls (/naɪˈæɡrə/, Cayuga: Gahnawehtaˀ or Tgahnawęhtaˀ is the collective name for three waterfalls that straddle the international border between Canada and the United States; more specifically, between the province of Ontario and the state of New York. They form the southern end of the Niagara Gorge. 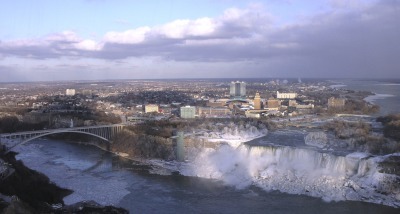 Located on the Niagara River, which drains Lake Erie into Lake Ontario, the combined falls form the highest flow rate of any waterfall in the world, with a vertical drop of more than 165 feet (50 m). Horseshoe Falls is the most powerful waterfall in North America, as measured by vertical height and also by flow rate. 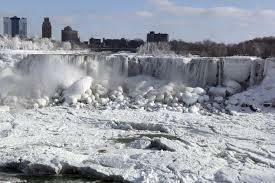 The falls are located 17 miles (km) north-northwest of Buffalo, New York and 75 miles (121 km) south-southeast of Toronto, between the twin cities of Niagara Falls, Ontario, and Niagara Falls, New York. A team from the U.S. Army Corps of Engineers dammed the falls in June 1969 to clear rock from the base of the falls. Rockslides had caused a significant buildup of rock at the bottom of the American side of the falls, and the engineers were to clean up the rock and repair some faults to prevent eventual erosion of the American side of the waterfall. A temporary dam was constructed to divert the flow of water to the Canadian side; the dam measured 600 feet (180 m) across and was made of nearly 30,000 tons of rock. The engineers cleared the rock debris and tested for safety, finishing the project in November of that year. Water flow was restored on November 25, 1969. "Niagara Falls. This name is Mohawk. It means, according to Mrs. Kerr, the neck; the term being first applied to the portage or neck of land, between lakes Erie and Ontario. By referring to Mr. Elliott's vocabulary, (chapter xi) it will be seen that the human neck, that is, according to the concrete vocabulary, his neck, is Manyara. Red Jacket pronounced the word Niagara to me, in the spring of 1820, as if written O-one-a-ga-rah. "[Before the late 20th century the northeastern end of the Horseshoe Falls was in the United States, flowing around the Terrapin Rocks, which was once connected to Goat Island by a series of bridges. In 1955 the area between the rocks and Goat Island was filled in, creating Terrapin Point. In the early 1980s, the United States Army Corps of Engineers filled in more land and built diversion dams and retaining walls to force the water away from Terrapin Point. Altogether 400 feet (120 m) of the Horseshoe Falls was eliminated, including 100 feet (30 m) on the Canadian side. 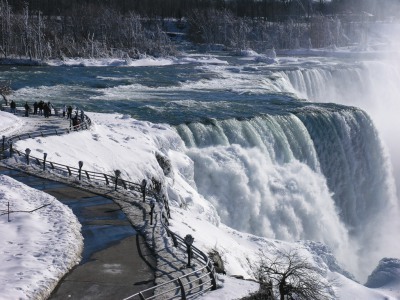 According to author Ginger Strand, the Horseshoe Falls is now entirely in Canada. Other sources say, "most of" Horseshoe Falls is in Canada.